In the past five years, over 5,200 CLS clients have been helped by pro bono attorney volunteers with Colorado Legal Services. The value of the pro bono donations of time to CLS clients by private attorneys for these five years is over $11 million. Thank you to all our wonderful volunteers who enable us to help many more clients! This week is National Volunteer Appreciation week, and CLS would like to thank all CLS volunteers! We could not provide the amount of nor level of services to our clients and to Colorado’s self represented litigants without your assistance. The Boulder County Bar Association honored Louisa Young with the John Robert Marshall Award for her dedication in providing legal services to the poor. Craig Small, president of the Boulder County Bar Association, presented the award, which is bestowed annually in honor of John Robert Marshall, a local attorney who tirelessly advocated for the poor. Louisa Young was recognized for her unwavering commitment to pro bono service and her continued passion as a Boulder County Legal Services volunteer advocating for access to justice. She marked her 50th anniversary as an attorney this past summer. Her “can-do” spirit, her enthusiasm and her readiness for a challenge inspire her colleagues and friends. Chief Justice Rice Proclaims Oct. 23-29 as Pro Bono Week – more information here! Pro Bono Commitment and Recognition Program – recognizing for calendar year 2015 those firms and groups that achieved the annual goal of 50 hours of pro bono legal services (listing as of September 7, 2016). Click here for more information! Free Legal Clinics this week in celebration of Pro Bono Week! Adams & Broomfield residents -Wed. Oct. 26 – click here for more information. Jefferson County residents – Thurs. Oct. 27 – click here for more information. 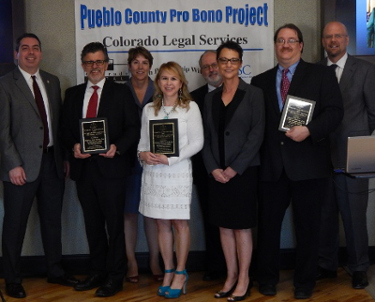 On June 19, 2015, the Pueblo County Bar Association, in collaboration with the Pueblo County Pro Bono Project, hosted the Pro Bono Recognition Event during its annual meeting. The “Lifetime Achievement Pro Bono Leadership Award” (recognizing an individual who has demonstrated exemplary leadership and outstanding and sustained service to the public) was presented to Judge Joe T. Ulibarri. The “2014 Outstanding Service Pro Bono Award” (for exceptional commitment to the public good and justice for all) was presented to Shad L. Brown, Christine Pacheco-Koveleski, and Matthew Scott Martin. These three attorneys rotated every week throughout 2014 in serving domestic violence victims at the Pueblo Protection Order Clinic, representing victims at permanent protection order hearings. Boulder County Legal Services (BCLS) celebrated the outstanding tradition of pro bono service in Boulder County at the Annual Pro Bono Luncheon, held April 6th, 2015, at the Boulder Marriott. BCLS honored local attorneys, mediators, law students, and paralegals who volunteered 5,875 hours in 2014 to provide legal services to low-income residents of Boulder County. 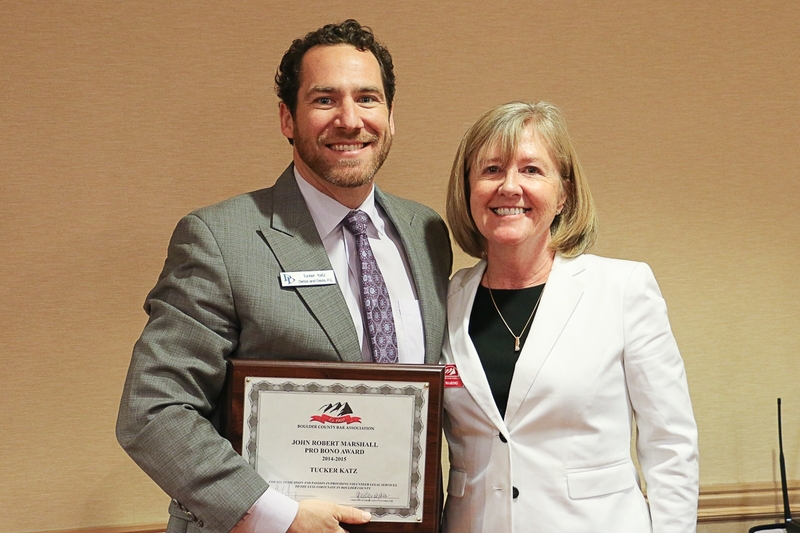 Boulder County Bar Association president Star Waring presented the bar’s highest award, honoring Tucker Katz with the John Robert Marshall Award for his dedication in providing legal services to the poor. Star Waring, president of the Boulder County Bar Association, presented the award, which is awarded annually in honor of John Robert Marshall, a local attorney who tirelessly advocated for the poor. Tucker Katz was recognized for his unflagging commitment to pro bono service, his deep commitment to the community he serves, and his dedication to upholding the high standards of the legal profession. Colleagues remarked on his keenly developed sense for the plight of his fellow citizens who have no access to the legal system because they cannot afford a lawyer, his fairness as an advocate, and his caring and empathetic manner. 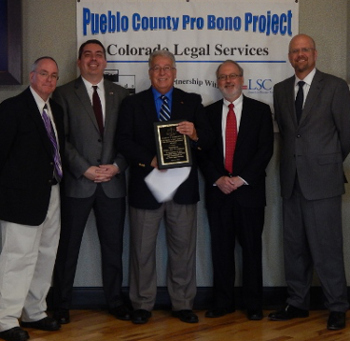 The Northwest Colorado Legal Services Project traditionally presents our Pro Bono Attorney of the Year award to an attorney who has gone above and beyond in his or her assistance to our low-income clients. 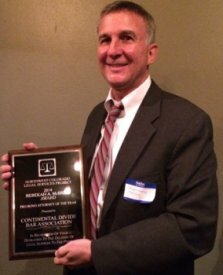 In September 2014 we presented this award to the Continental Divide Bar Association – the first time we have given the award to a Bar Association! The Continental Divide Bar Association has consistently identified Pro Bono service as a high priority, and encourages its membership to donate their professional time. CDBA members donated over 600 hours of their time in 2013; this time was valued at over $100,000. In the past five years, CDBA members have given over 3300 hours of their time, valued at over $500,000. In addition, the CDBA has provided financial support to the Northwest Colorado Legal Services Project for over 25 years. They increased their support during the recent Recession; in the past five years, the CDBA has donated $65,000! Pro Bono coordinators are part of every Bar meeting, and information on pro bono activities is a regular item on the agenda. This Bar Assoc. lives its philosophy of public service in everything they do. Thank you for your dedication to the philosophy of access to justice for all.